Safety experts recommend staying off the phone while driving, even with hands-free devices, because of the distraction calls represent. Tom Hardy’s construction foreman character learns that lesson the hard way in Steven Knight’s Locke. Hardy earned a Best Actor Independent Film Award nomination and Knight won a BIFA for Best Screenplay (beating out Philomena and Le Week-end, among others), a testament to this involving drama’s power. Hardy plays Ivan Locke, who leaves his work site the evening before the concrete is to be poured for the foundation of his latest project. It’s a massive undertaking, the pour said to be the biggest in Europe for a non-military installation and one that he has been eagerly anticipating. But he is going to miss it, just as he is going to miss watching a football match with his wife Katrina (Ruth Wilson) and sons Eddie (Tom Holland) and Sean (Bill Milner). Instead of going home, he hits the highway and the evening becomes a series of phone calls with Katrina; the kids; Gareth (Ben Daniels), his angry boss; Donal (Andrew Scott), the overwhelmed subordinate he expects to take his place during the pour; Bethan (Olivia Colman), the woman whose phone call started him on his journey; and others. When Ivan isn’t on the phone, he holds angry imaginary conversations with his late father. He never stops talking. A longtime screenwriter, Knight, who received an Academy Award nomination for his screenplay of Stephen Frears’ Dirty Pretty Things and also penned Eastern Promises for David Cronenberg, takes risks in directing only his second feature (his debut was the Jason Statham-starring Redemption). The drama takes place entirely within the confines of Ivan’s car, with closeups of Hardy alternating with shots of the road. Hardy’s costars are all but voices coming through his Bluetooth. It is a set-up that could get old fast, but instead it is riveting, a character study on wheels of a man trying to do the right thing and failing miserably. Adopting a crisply enunciated Welsh accent, Hardy is terrific as a man who courts personal disaster, but sees no other alternative. He is too conscientious to lie his way out of the situation, or maybe he lacks the imagination for invention. He isn’t stupid, but he is as dense as the concrete he pours. It is admirable that he is trying to do the right thing. The effect of his effort, though, is brutal. His clear conscience comes at a price and he is not the only one paying it. The voices on the other end of the calls are so strong that it scarcely matters that people talking are never seen. Especially effective are Wilson, as Katrina’s anger grows with each phone call, and Scott. So slippery and smart as Holmes’ nemesis Moriarty on Sherlock, Scott is brilliant playing the other end of the spectrum in Locke, a simple man who is comfortable in his minor role at the construction site. The thought of filling Locke’s shoes sends him into a dazed panic. Donal is the film’s comic relief, but he is also touching, particularly in his loyalty to Ivan when it would simply his life tremendously to simply ignore Ivan’s calls and let Gareth sort it out. The strength of Knight’s writing and the performances of the voice cast are such that even the smallest parts—such as that of a drunken bureaucrat angered at being disturbed at dinner—are actual characters rather than simply disembodied voices. 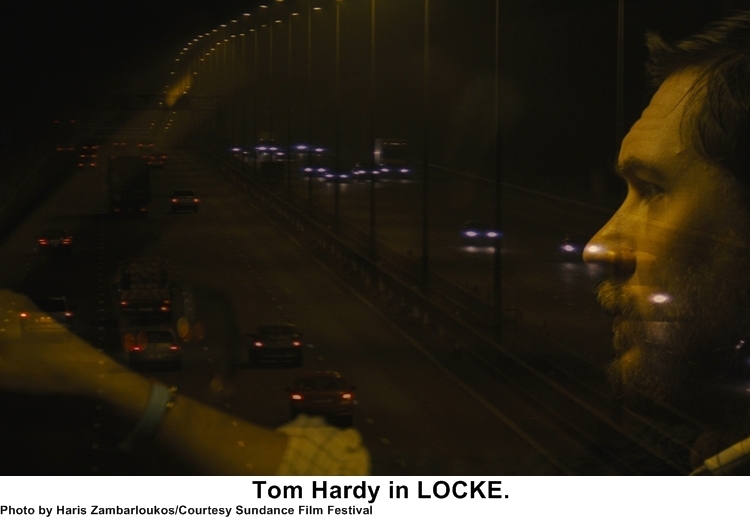 For more about Locke, read Steven Knight’s SUV-driven ‘Locke’ set amid grip of technology.